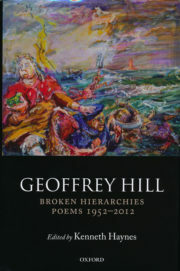 Having spent much of 2014 savoring Geoffrey Hill’s colossal Broken Hierarchies: Poems 1952-2012, I’ve come to accept that any review of it will falter as piecemeal commentary in the shadow of its achievement. At nearly a thousand pages, this stoic hardcover is as imposing as its contents, since it collects twenty-one books the poet composed over six decades. And yet, even a brief consideration of Broken Hierarchies seems worthwhile—particularly for American readers—since the cumulative brilliance and range of Hill’s oeuvre make him unquestionably England’s greatest living poet. Hill takes all of Western thought—its moral dialogue, its metaphysical yearning, its ceaseless search for metaphor—as his subject, and casts it against the backdrop of an amnesiac world too often corrupted by indifference and too often aflutter with vogues to heed wisdom. One need only read his powerhouse sequence “Funeral Music” or his pastoral elegy “In Memory of Jane Fraser” to feel the force of his talents. Americans must look to Norman Dubie or David Wojahn to find a stateside poet who can wield such expansive diction and historical allusiveness without squandering pathos. At first blush, Hill’s tautly metered verses about Our Lady of Chartres, or Cromwell, or the Pre-Raphaelites may seem starkly traditional in a literary age that champions irony and hybrid forms. In his essay “Englands of the Mind,” reprinted a decade ago in Finders Keepers: Selected Prose 1971-2001, Seamus Heaney wrote that Hill celebrated “his own indomitable Englishry, casting his mind on other days, singing a clan beaten into the clay and ashes.” But Hill is also the sly, prose-poem modernist who zooms through Mercian Hymns, the agitated citizen who fumes in A Treatise on Power, and the demure, earnest word-lover who attacks advertising’s corrosive influence on literature in his interview with The Paris Review. This entry was posted in Uncategorized and tagged Summer 2016 on July 11, 2016 by Kelly.